Will work with both internal and external threads. Verifies or chases threads at rates up to 1,600 holes (or male threads) per hour. Hole-to-hole movements are manual. The counterbalanced pantograph supplied diminishes operator fatigue, and eliminates the possibility of crossthreading. The System, not the operator, determines whether the thread has been successfully verified or chased. Utilizes the same patented New Vista mechanisms that are in use in New Vista-supplied installations all over the world. Will run a variety of parts, both large and small. Can accommodate male or female threads of varying sizes. When equipped with one of the New Vista Quick-Change Toolholders, changing from one thread to another takes only a few seconds. Will gage or chase various thread depths without tuning in. Three thread sizes, our hole patterns on 3 surfaces; hole-to-hole time is 2.5 seconds. Fixturing is simple; or, in many cases, not required at all. Foolproof. Once the threaded feature is engaged, the System, not the operator, decides what is good. Registers as rejects: short threads, no threads, undersize or oversize threads; wrong pitch threads; holes with broken taps or other obstructions. Utilizes standard production-proven, patented New Vista mechanisms and controls. Low maintenance and long tool life. Will inspect for “GO”, “NO GO”, or combination characteristics. 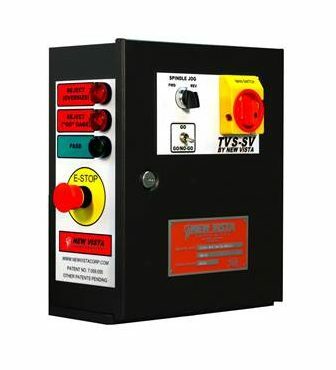 Fingertip torque control…you can set it, then lock it and leave it. Depth rod feature guarantees precision verification of thread depth. Utilizes New Vista Quick-Change Toolholders. See Catalog Sheet 208-031. Will not jam or stick in undersize or short threads. 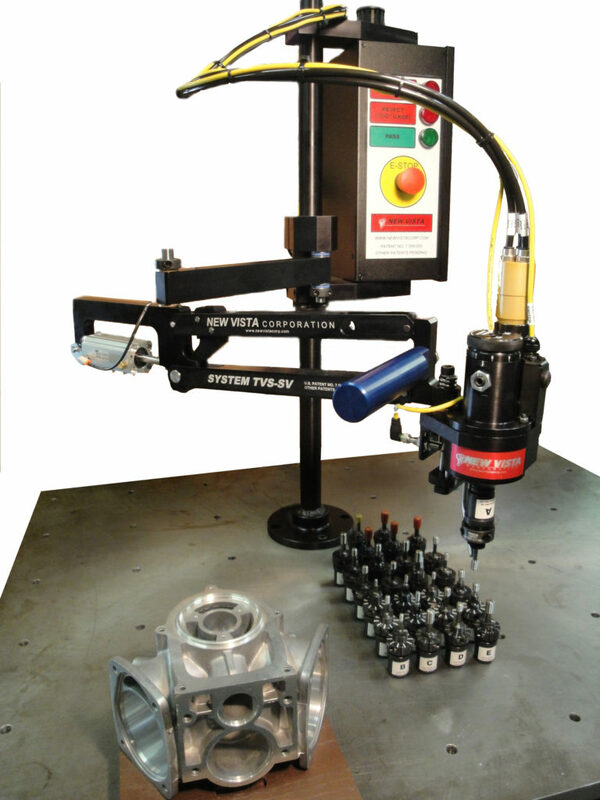 Will not subject the operator, the part or the tooling to high force or torque levels…even with a reject. Standard models available that will run threads from M3 through M50 (#4 thru 2”). “Full Count Option” guarantees that no holes in a pattern are missed. The Control and Monitoring Unit shown here¹ is part of the System. Once the operator engages the threaded feature, the control takes over, runs the tool to depth and automatically reverses it out. The machine makes the decision whether the thread has been successfully verified or chased; the operator cannot override it. 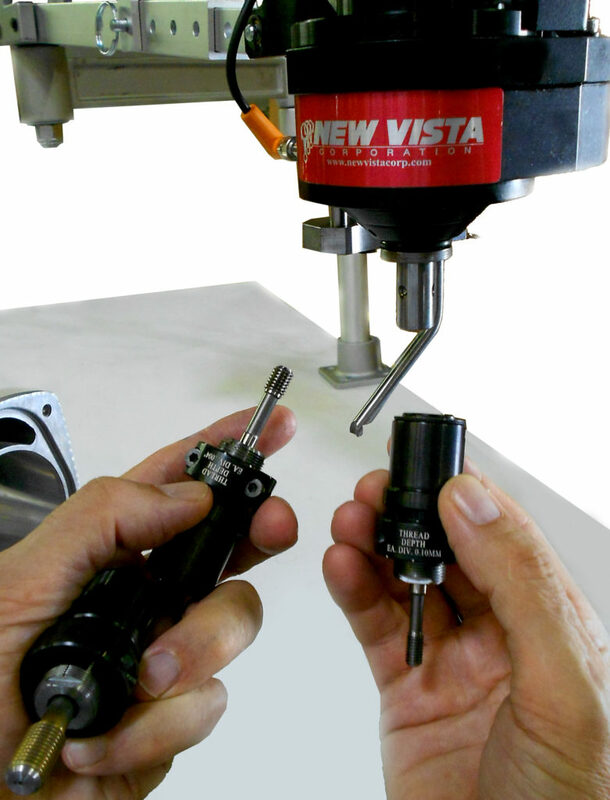 New Vista Quick-Change Toolholders will accommodate any size or depth of thread. This is the device that you set to accurately verify thread depth. 1 HMIs are also available with color touchscreen displays.